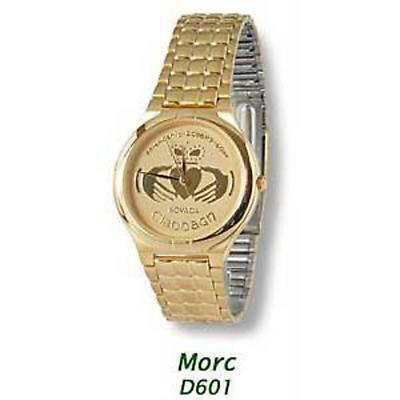 Nodens Trinity Knot Celtic Watch. Men's two-toned silver-plated case, dustproof construction, diam. 1.25 inches. (33mm), Japanese quartz movement, date and 'night-glow' feature, 3 year battery, stainless steel back. Two-tone, matt and shiny, stainless steel band with butterfly clasp. Multi-coloured Triskel design on the dial. Illuminating background of the dial when the button is pressed. Please allow up to 5 days for watch to dispatch even with our express shipping service. 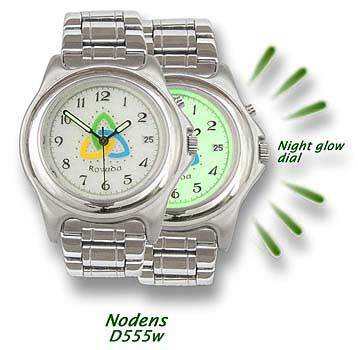 Nodens: British god of healing, related to the Irish Nuada and Welsh Nudd Triskel: also known as 'Trinity' or 'Love Knot' The Triskel design on the dial is one of the basic Celtic designs. The circles represent the three domains of ancient Celtic belief: the underworld for the past, the earth world for the present, and the sky world for the divine.